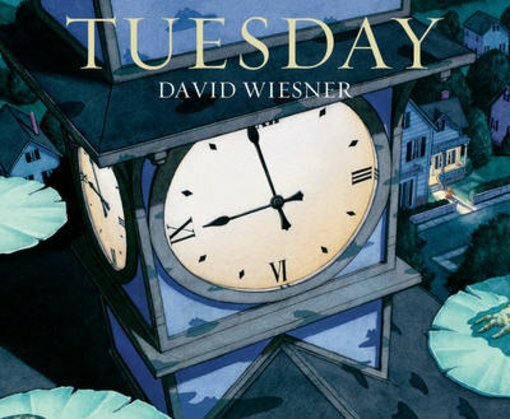 It’s Tuesday – an ordinary Tuesday. Or maybe not quite so ordinary. Not in this classic picture book, anyway. For a start, it has almost no words. That’s unusual, isn’t it? And secondly – look at those frogs by the pond! Have you ever seen anything like that? The frogs are lifting off on their beautiful lily pads. They’re flying off on them like you might ride on a magic carpet, if you had one! They zoom into town, swoop through a woman’s apartment and surprise a dog playing in his yard. They distract a man in a bathrobe from his midnight snack. And then they go home, leaving (almost) no clues at all. Hmm: who knows what will happen next Tuesday?